By combining outdoor elements such as ceremonial and abstract floral designs, the Floral Blossom Dining Set by Home Style is brought to life. This set is constructed of cast aluminum in a powder-coated charcoal finish with patterned Weather-resistant burnt sierra leaf polyester cushions. The 42-inch outdoor table and four armchairs features hand-applied antiqued highlighting sealed with a clear coat for protection attractive patterned design, 2-inch umbrella hole with black cap, and nylon glides on legs for stability. Elegant design and sturdy construction, this piece is finished off with stainless steel hardware. Assembly required. Set includes 42-inch table and four armchairs with cushions. This patio dining set makes it easy to create a backyard space you'll love. Constructed with a weather resistant resin wicker that is easy to maintain and durable ensures this patio set remains beautiful for years. The generously padded seats make it a treat to relax in and enjoy the fresh air with friends and family. The powder coated aluminum frame is another important detail that highlights the thoughtful construction evident throughout this set. Extend your homes living space in your own backyard with this inviting 5pc patio dining set from the Park Terrace Collection. This set assembles in minutes creating an elegant and easy care setting. Durable steel frames, UV resistant resin wicker and tempered black glass tabletop give the finishing touches that make a statement. Simple lines and Parson shaped chairs complete the transitional design. Featured in a Charcoal Black Rope Weave and accented with a black glass table top this 5 piece set is a great way to outfit your outdoor deck space. Dont discount the value of a comfortable dining set by the swimming pool, garden or patio this summer. The PPT-603-Z 5pc Patio Dining Set offers a great place for family and friends to gather. After a simple assembly, the contemporary table and four chairs quickly complete even smaller spaces like an apartment balcony. The steel frames, black safety glass and UV resistant resin rattan are durable enough to withstand the elements so you can enjoy outdoor dining this spring, summer and beyond. Match this dining set with the rest of the Park Terrace collection from Sonax. 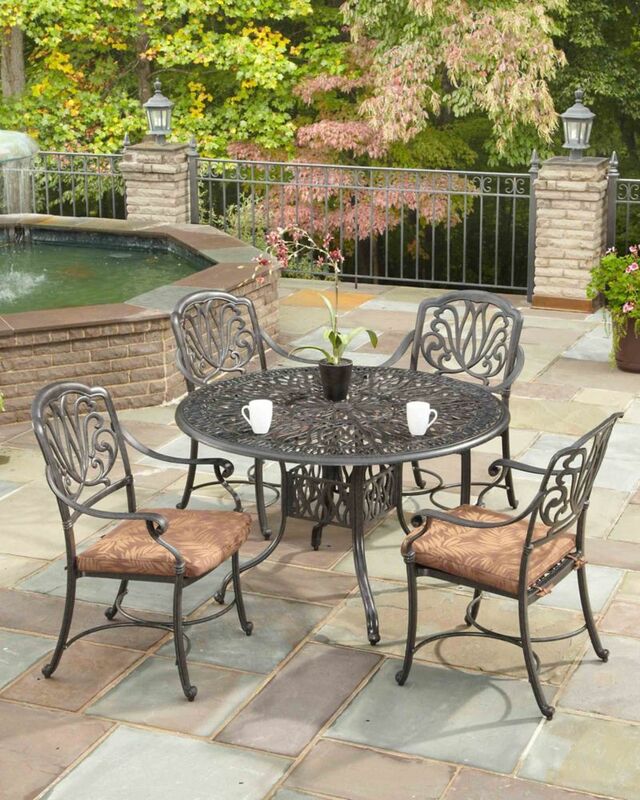 Floral Blossom 5-Piece Patio Dining Set with 42-inch Round Table and Arm Chairs in Charcoal By combining outdoor elements such as ceremonial and abstract floral designs, the Floral Blossom Dining Set by Home Style is brought to life. This set is constructed of cast aluminum in a powder-coated charcoal finish with patterned Weather-resistant burnt sierra leaf polyester cushions. The 42-inch outdoor table and four armchairs features hand-applied antiqued highlighting sealed with a clear coat for protection attractive patterned design, 2-inch umbrella hole with black cap, and nylon glides on legs for stability. Elegant design and sturdy construction, this piece is finished off with stainless steel hardware. Assembly required. Set includes 42-inch table and four armchairs with cushions. Floral Blossom 5-Piece Patio Dining Set with 42-inch Round Table and Arm Chairs in Charcoal is rated 4.0 out of 5 by 2. Rated 5 out of 5 by handymama from Excellent Excellent quality. Comfortable chairs. Very nice set. Rated 3 out of 5 by pete from Everything arrived in 3 large boxes. One of the chairs arrived broken, despite the boxes being in... Everything arrived in 3 large boxes. One of the chairs arrived broken, despite the boxes being in fine shape. The table is very nice and solid, however the chair build quality is not so impressive. The pieces do not fit together squarely. The end caps are useless, do not stay in place. The stabilizer below the seat area has less than pleasing hardware to attach to the legs. The levelers on the chairs and table are a nice touch, at least. Overall the seats are comfortable and the cushions are holding up fine - but I don't know if the chairs have the longevity I'd expect for the price. Time will tell. Have contacted "Homestyles" regarding the broken chair piece.